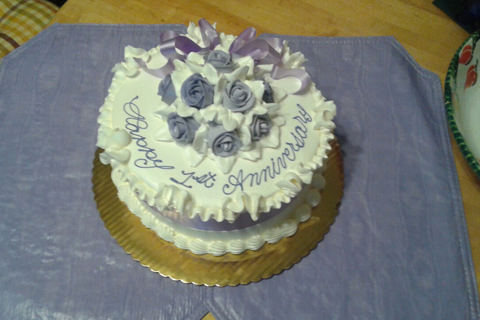 Denyce and I started a new tradition; while the ideas are not original, they make us look forward to our next wedding anniversary. 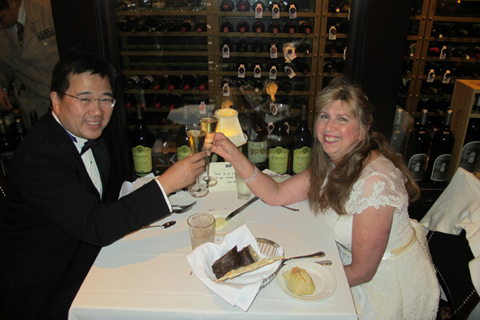 We went to the Capital Grille in Burlington for our anniversary and wore our wedding outfits to the restaurant. They've hosted weddings there in the past so they're used to people dressed up like that. Denyce's dress is a Tea-length dress, perfect for swing dancing at a reception. I had my tux from the days when we brought in Frankie Manning for workshops and the Black & White swing dance (a loooong time ago). I must admit I wasn't entire enthusiastic about the whole thing, and a few friends frowned on the idea, but it ended up being a lot of fun. I was nervous walking through the dining room and everyone watching us. On the other hand, the wait staff loved it and went out of their way to be extra nice to us. The other restaurant guests also came by to compliment us. One of the waitresses said she was going to steal our idea and do it too. The restaurant had asked us if we were celebrating anything when I made the reservations. There was a special note at the table when we arrived welcoming us and congratulating us. There were little foil heart confetti scattered across the table. 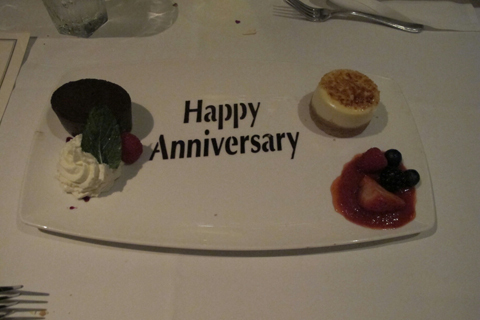 Just before they showed us the dessert menus, they gave us a plate of desserts on a plate that had the words "Happy Anniversary" on it. That wasn't the only thing we did. When we went to do some cake tasting at Konditor Meister last year, we met a guy who made a tradition of getting a cake every year for his anniversary from Konditor Meister because they made his wedding cake. What a great idea! We went up to Montréal the other weekend and stayed at the wonderful Auberge Bonaparte in Old Montréal. It's small but luxurious hotel on Rue St. Francois Xavier, stuck between the newer Rue Notre Dame and the old Rue St. Paul so you get both old and new Montréal to explore. While waiting for your room, you get to sip an Italian sparkling wine (aka "champagne"). Our room had hard wood floors as well as large windows with a great view. The room came with breakfast and what a fabulous breakfast it was. To be honest, it was a little more expensive than what I'm used to paying for a room, but with the current exchange rate (1 US dollar = 1.31 Canadian dollars) the price was actually reasonable. We had stayed in Burlington, Vermont the night before. Considering what we paid for the Quality Inn, the Bonaparte was a bargain. I used to assume that the Comfort Inn was a lesser hotel chain than the Quality Inn; I now think it's the other way around. As we sat in the Bonaparte lobby, some guy walked in with a New England Patriots t-shirt. It was a couple from New Hampshire. It was their first time staying at the hotel, but they've been going up to have dinner at the hotel for her birthday every year. Maybe this is another tradition to add to our growing list. Beware of store proprietors who accept American money at par. They know exactly how much your American dollars are worth. It's worse when they give you your change in Canadian current for your American money. The better stores will post the daily exchange rate at the register so you know how much you need to spend. It's a wonderful tourist destination for Americans and they know it. For late night drinks, I must suggest Pub BreWskey at 380 Rue St-Paul Est. Very friendly English-speaking bartenders. Be sure sure to differentiate between east and west. We went down to 380 St-Paul until we realized that we were at 380 St-Paul West. We had to walk down to St. Laurent that divides those streets into East and West. FYI: Not knowing French was never a problem. Pretty much everyone knew English and was friendly about it. Montréal will be celebrating its 375th anniversary in 2017. One of things that's happening in Montréal *now* is that they're tearing up a lot of streets and doing a lot of construction in preparation for next year. Take that into account when driving around there. The street in front of the hotel was a massive hole so I couldn't drop off luggage in front of the hotel. Suppose you want to go in for some LASIK eye surgery. Someone you know says, "I had it done and I think I can figure out how to do it". Do you go with the friend, or perhaps you might want to go look for someone who's done it a few thousand times and has a positive record they can point to? When it comes time to fight for civil rights or give the final GO/NO GO command to a military operation 10,000 miles away, whom do you trust? The guy who says, "I can do it and I'll be GREAT! ", or do you want the person with 30+ years of experience? Some people have questioned the integrity of some of the women who came forth to accuse Donald Trump of having sexually assaulted them. "Why are they coming out now, just a few weeks before the Election?" they're asking. Well, I already knew the answer to that question, but wasn't able to come up with a good coherent speech. However, this article from the New York Times might be able to do that subject justice. Do (some) people want term limits because they really don't think politicians should be in the same office too long or is it because it's the only way to get rid of a politician that everyone *else* likes? On November 8, you have a special duty to carry out: you must go out and vote. You cannot sit out the election. This election is too important. Not voting means you're giving someone else the right to choose for you and you might not like their choices. If you don't like the two major candidates, you have to think about who's the worse candidate and whether or not you want to risk that candidate getting into the White House. In a way, we must draw the lesson from Great Britain's "Brexit" vote where a lot of people put in a protest vote to leave the European Union and realized afterwards that their side actually "won" and that's not what they wanted. There's no "dislike" checkbox beside each ballot question or candidate to let them know that you're supporting that side but you are not happy with the idea. If you truly believe that Gary Johnson of the Libertarian Party or Jill Stein of the Green Party represent	your views or plans for America, then by all means, cast a vote for them. At least that's a positive action where you're voting for something you believe in. However, casting a "protest" vote for these two is a stupid idea because no one's going to notice and no one's going to care. Your protest vote will get drowned out by the even stupider people who are not going to the polls. And you might be helping to elect a very bad person to the country's highest office. How am I voting, you must be asking? I'm voting for the grown-up. I'm voting for the steady public servant with years of experience trying to make things better for the people who don't have a lot of money nor a lot of influence (we're talking about the lowest *94%* of the population, not just the lowest 47% here). I'm voting for the most vetted politician in the history of the United States, the one who has been investigated by a vindicative opposition for the past 30 years with nothing to show for it (We should be asking for a refund for all that money wasted on those investigations. What about the distractions from the issues and dangers facing this country?) I'm voting for the one who treats all equally without prejudice towards their gender, race, creed, or sexual orientation (sorry if I left any out). But I'm also voting against the thin-skinned 5-year-old misogynist (thank you for making me look up that word!) who can be prodded into predictable reactions even when coached and trained to not misbehave. Which candidate is more preferred by the countries who don't like us? Which candidate is preferred by our *friends*? I'm voting against the candidate who thinks that bankrupcy is smart financial planning. I'm voting against the person who ran a lot of companies into the ground and stiffed his creditors and contractors. I'm voting against the candidate who has disparaged our military veterans. ("Yes, I've always wanted a Purple Heart; this way is easier", that is, not serving our country and not getting wounded in combat). I see that most (if not quite, all) of the major newspapers in the *country* are endorsing the same candidate, even if they disagree with their political views. The point to consider is that these publications spent a lot of time investigating and considering their choices and published their reasons on paper. That gives you a lot of material to come to the logical choice for the highest office in the land.